Burt Ward (born July 6, 1945) is an American television actor and activist. 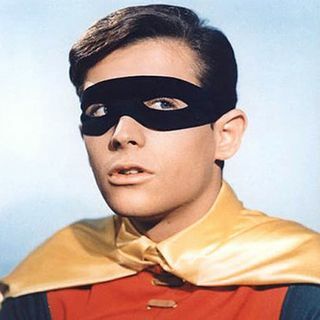 He is best known for his portrayal of Robin in the television series Batman (1966–68) and its theatrical feature film.Ward was born Bert John Gervis, Jr., in Los Angeles, California. His father, Bert Sr., was the owner of a traveling ice show called "Rhapsody On Ice". At age two, Ward was listed in the magazine Strange as It Seems as the world's youngest professional ice skater. Growing up, he was an avid ... See More reader of comic books such as Superman and Superboy, and enjoyed the action-adventure show Adventures of Superman. He acquired the nickname "Sparky" in youth, possibly from the sparks his skates kicked up during his routines or his energetic nature. He excelled in high school sport activities such as football, track, and wrestling; he was also a member of the chess club and earned a black belt in Taekwondo.After graduation, he enrolled in college, while working part-time for his father's real estate company.Burt said of Adam West, his mentor and friend for more than four decades, "We were completely opposite. Adam has been in many shows, tremendous, terrific background, but very "Mr. Hollywood". He wanted his tea at 4 in the afternoon, and me, I'm just like this kid that doesn't care, having a great time. And I think that's one of the reasons that the public like them because Adam was very introspective and I'm just this exuberant kid." In 1969, a year after Batman's cancellation, West's mother died, bringing the two men closer together. They have been reunited many times at conventions and TV reunion specials. In turn, Ward also made three guest appearances with West on separate cartoons: one was a 2002 episode of The Simpsons, later in 2010 on an episode of SpongeBob SquarePants, and in 2013 for one of the final episodes of Futurama.